The De Rooy team, winners of the 2016 Dakar rally truck class, are going for gold again in the world’s toughest race, driving on standard Goodyear Offroad ORD tires. Gerard De Rooy and his team have chosen Goodyear Offroad ORD truck tires for their four race trucks and Goodyear Omnitrac mixed service tires for their service trucks. The team is aiming for repeated success after last year’s win with the long-term dedicated support of the leading tire manufacturer further providing testing and back-up. 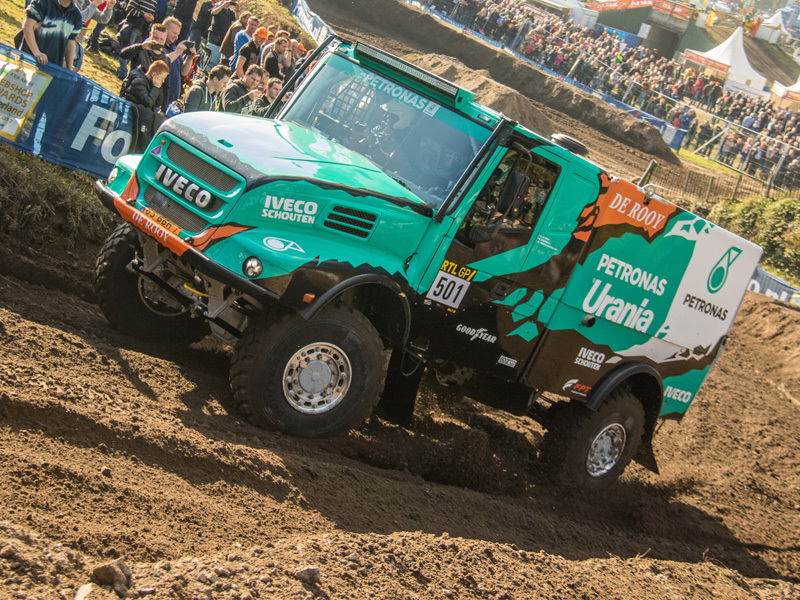 Ton Van Genugten – 5th in Dakar 2016 – driving an Iveco Trakker. Wuf Van Ginkel – New Member – with twelve previous Dakars and finished 4rd in 2007 – driving an Iveco Trakker. The four race trucks will compete on standard Goodyear 375/90R22.5 Offroad ORD tires as will all the fast service assistance trucks, while the other service trucks will use Goodyear 315/80R22.5 Omnitrac MSS II and Omnitrac MSD II truck tires, mounted on the steer and drive axles respectively. The choice of Goodyear Offroad ORD tires is based on the long and successful partnership between De Rooy and Goodyear. In close cooperation with engineers from the Goodyear Innovation Center Luxembourg including extensive joint testing, the team was able to achieve the best setup to optimize tire performance in all the varied conditions the race trucks will face during the Dakar 2017. Following the great performance of the Goodyear tires in the Dakar 2016, the team decided to rely on standard Goodyear Omnitrac mixed service truck tires for their rally service vehicles. "The Goodyear Offroad ORD 375/90R22.5 off-the-road truck tires are fantastic and were a key element in us winning the 2016 event. We have had incredible technical support from Goodyear engineers and this is why we have chosen Goodyear again as our tire partner for what is without doubt the toughest test for truck tires in the world. We are confident that this continued partnership will give us the necessary traction and reliability to ensure we can win again in 2017," said Gerard De Rooy. "We are delighted that Gerard De Rooy and his team have chosen Goodyear tires again for their attempt on the 2017 Dakar title. We have worked long and intensively with them to help find the best set-up for the race trucks and to provide the back-up that is essential for this event to be a success for the team. But just as important is the technology leadership that enable them to perform under such challenging conditions. However it does not end there as the results and experience from the Dakar form part of our work in the development of future truck tires," said Benjamin Willot, Director Marketing Commercial Tires at Goodyear Europe, Middle East and Africa. The first stage of the rally starts in Asuncion, Paraguay on January 2. From there the more than 550 trucks, cars and motorcycles cross into Bolivia, driving as far north as La Pax, and then down into Argentina where the event ends in Buenos Aries on January 14. The Dakar comprises a total of 12 stages covering over 8,500 kilometers of the most challenging terrain including deserts, high mountains and rocks. Goodyear is one of the world’s largest tire companies. It employs approximately 66,000 people and manufactures its products in 49 facilities in 22 countries around the world. Its two Innovation Centers in Akron, Ohio and Colmar-Berg, Luxembourg strive to develop state-of-the-art products and services that set the technology and performance standard for the industry. Goodyear Dunlop Europe’s range of tires for commercial vehicles, buses and coaches includes more than 400 different tires covering in excess of 55 sizes. Many of the world's leading commercial vehicle manufacturers fit tires from Goodyear as standard, including DAF, Iveco, MAN, Mercedes-Benz, Renault Trucks, Scania and Volvo Trucks. Goodyear also supplies tires to all major trailer manufacturers. With FleetFirst, which includes the TruckForce service network, ServiceLine24h roadside assistance, FleetOnlineSolutions (an internet-based fleet management system) and Goodyear retreading services, Goodyear provides one of the broadest ranges of fleet-efficiency services in the industry. For more information on Goodyear and its products, visit http://www.truck.goodyear.eu​.